The Saffron Road is the story of three unforgettable journeys; the journey that Buddhism has travelled from East to West, the extraordinary individual journey taken by women around the globe to becoming Buddhist nuns, and Christine’s own journey in search of deeper understanding and healing wisdom. As a foreign correspondent for more than twenty years, Christine has travelled to many part of the world riven by conflict, and reported on women whose lives have been marked by tragedy and suffering. But when she first encountered the stories of Buddhist nuns, she was struck by a courage born not only of tragedy or brutality, but of a longing to achieve enlightenment and a compassion and determination to help others reach a path to achieve it too. To step inside the world of Buddhist nuns is to journey to a place of strength and conviction, a place where women are choosing to devote their lives to grappling with the most profound and intractable problems of human existence. Beginning in the Himalayas, close to the birthplace of the Buddha, The Saffron Road tells the story of a two-year, 60,000-mile global odyssey in which Christine travels from Nepal to India, then through Burma, Japan and on to North America and Europe, visiting contemporary nunneries along the way to meet the women who practise there. Following in the footsteps of earlier generations of Buddhist nuns, she traces the routes by which the philosophy has spread from a solitary order in a remote area of India in the 5th century BC, via 1950s San Francisco, where Zen was popularised by the Beat generation, to the globally renowned practitioners of mindfulness of today. Amongst those she talks to are a group of “kung fu” nuns, an acclaimed novelist, a princess, a concert violinist, a former BBC journalist, and a one-time Washington political aide. Through these conversations, the daily reality of the Buddhist existence is gradually revealed, together with the diverse spiritual paths leading these women towards nirvana. 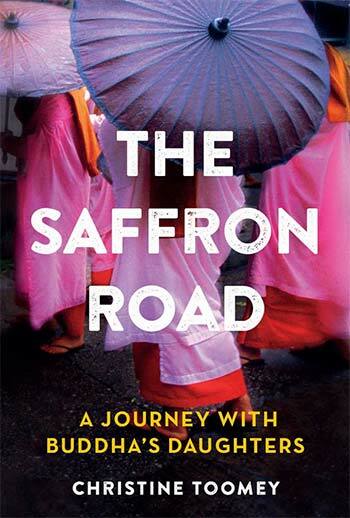 Combining travelogue, history, interviews and personal reflection, The Saffron Road opens the door to a rarely glimpsed world of ritual, discipline and enlightenment.